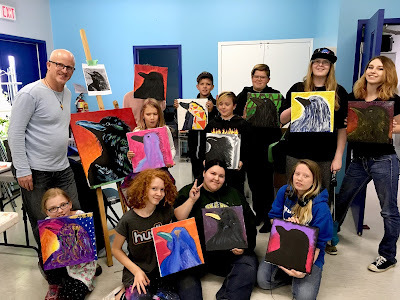 I am so glad that I was able to experience the Heartland Youth Center's Awesome Auction from the vantage point of the stage where I was doing a live painting of a rooster. At the top of the night, Winnie (bless her heart) provided some context for the 300 guests as to who I was and why I was there. The event started as a radio auction back in the early 1990s. I joined the board and suggested we try something a little different, which was to display the items in a store on main street so people could physically see what they were bidding on. Revenues apparently jumped from around $2,000 to $8,000 in that second year. Where they have taken the event in the years that followed is truly remarkable. During the height of the oil boom, they were raised well in excess of $100,000 in a single night. The evening including a silent auction, steak and lobster meal, and four live auction segments. The action was non-stop and everyone stuck around to the very end. I loved listening to the skill of the auctioneers. There is such a musicality to what they do. They even had their Member of Parliament (Kevin Sorenson) get in on the auctioneering action. Because I had oodles of time, I was able to completely finish the painting of the rooster, including all four sides of the canvas. I don't think I have ever done that before. It helped raise $1,800 and was purchased by Genevieve and Joel, the couple that owns and operates the Canadian Tire store in Stettler. There were many highlights from my whirlwind trip to Stettler. Painting with the kids at the Heartland Youth Center was absolutely fantastic. I was also able to reconnect with the Fitzpatrick family after far too many years. The beautiful baby that I held in my arms back in the early 1990s is now a beautiful mom with three amazing kids. Sadly, I was so enamoured by the visit that I forgot to take pictures. And I was able to sit at a table with some lovely Stettler ladies including Karin Phibbs, who always exudes beautiful positive energy. Thank you to Winnie Bissett and the Heartland Youth Center for allowing me to be a part of the Awesome Auction and to the community of Stettler for making me feel welcome. I look forward to returning. Apparently the adults would like to participate in a workshop, too! Maybe we could convince Charlie Bagshaw to explore his artistic side?